For the look I think you are trying to achieve, you are going to need multiple lights, with soft boxes. I have a thread going from a studio class I took. You might benefit from having a quite look at some of the images. It was a portrait course, but the lighting used there is what you will need. Yes, your going to need a few lights. You would position lights and flag (to block the light) to add highlights to help shape the guitar. If you have a large window, patio door, you can use natural light. Just got air until you have good light coming through. Having shears over the window will halo make the light even better, less harsh. I just watched a video on lighting a guitar, as part of the Tabletop photography course that I'm taking through Creative Live. Don Giannatti used a small soft box, one speed light and foam core boards as reflectors. However, he shot major sections of the guitar separately, then composited them in Photoshop. Oh, he also had very good assistants! If you want to do it all it in one go, you won't go wrong following Art and Dennis' advice. Here is a sample where I used two 5ft umbrella's as cross light. Same principle as window light. Thanks a bunch, I'll check it out! 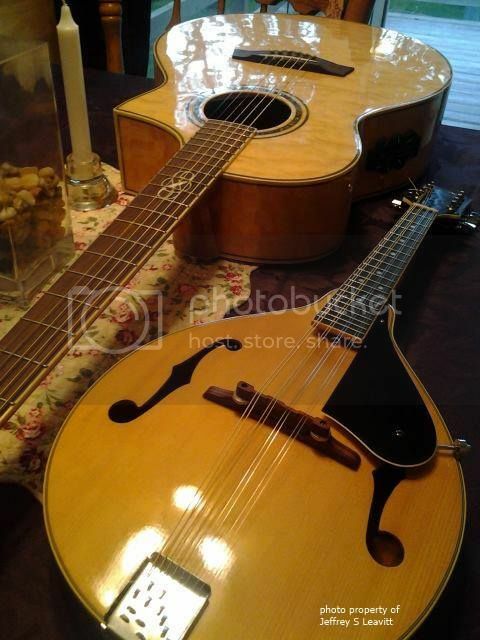 This is a photo I took of my Ibanez acoustic and mandolin a few years ago with my Galaxy 4 cellphone camera. It came out better than what I did with my D3300 (except the chandolier glare in the mandolin). Thanks for the tips guys! Place them on a stand, and angle them from the light. It will help. Lighting reflective surfaces is very challenging. I have a friend - a Nikon shooter - that makes high end custom fiddles and violins. We did a meet-up at his house a few years ago and experimented with lighting for finished and in process instruments. He was using a table with a big drape to create a seamless backdrop. He developed some stands to hold the violins allowing lighting to wrap around the instruments and light them from behind. We were using flashes, but constant lighting is easier to manage reflections. With strobes, you go through a series of test shot, correct and test again. Lighting from the side is extremely important, but you also end up making a lot of small adjustments to correct reflections on the neck or edges. Editing is always a bit more complicated because there are reflections that need to be fixed. It's possible to move around lights and composite multiple images in post. You can also use an HDR in some cases. You can shoot this with one light or various. By "light" I mean source. That can be a window or a strobe/flash. Capturing the shape and depth of an object is similar to shooting portraits. In the end you are playing with shadows and highlights to provide shape. If I may suggest something.... shoot an egg. No joking here. Shoot an egg. Setup the egg lying in any orientation and light it the way you would light the guitar. Then shoot it. It will give you the concept of how the light is playing with a 3D object. The soft curves of the egg will help you visualize how another curved object (guitar vs, for example, a box) will show depth. It's FAR easier to move the egg and/or camera around it than it is to deal with the full sized object. In the end, you will get the general drift of the lighting. All joking aside...... that is how I practiced different lighting setups for portraits. I would start simple... one light or strobe and then go from there. One thing. Keep a relatively small aperture. If you are shooting at f4 or f5.6 you'll get a shallow depth of field, relatively speaking, which will make getting everything sharp difficult. I'd be trying to light it such that you are dealing with f11 to f16. Edited by gregc, 10 August 2018 - 12:39 AM.